A story of music. A story of courage. The story of Zohra. The musicians of Zohra are smoothing out their dresses. Everything has to be perfect before the curtain goes up. It’s 6.30pm; on the other side of the drape is the culmination of a long journey. 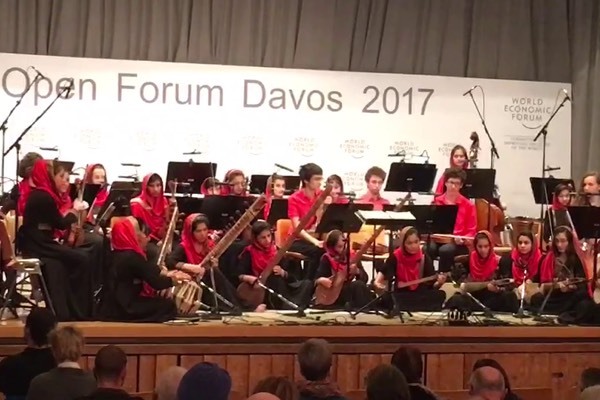 These 30 young Afghan women have flown all the way from Asia to perform in Switzerland in front of 2,000 world leaders. Instruments at the ready, Zohra – named after a Persian goddess of music – are about to bring to a close the 2017 World Economic Forum Annual Meeting. This isn’t just their first time outside Afghanistan, it’s the first time stage fright is the only fear they must brave. Back home, a performance by Zohra may be met with abuse or threats – or even bombs. Here they can – quite literally – show their true colours. Cloaked in exquisitely embroidered costumes, their heads wrapped in bright-hued headscarves, the young members of the Zohra orchestra are ready to share their culture and their message of hope with the world. Once a hotbed of creativity, Afghanistan saw its 1,000-year-old musical heritage almost disappear overnight. Between the Soviet invasion in 1979 and the fall of the Taliban regime in 2001, draconian Taliban policies – which included an outright ban on music – led to the deaths and forced migration of many musicians, and the decimation of the country’s musical and cultural life. Though the ban was lifted after the Taliban were ousted, large parts of Afghan society still frown upon music. Music flourishes at the court of Amir Sher Ali Khan in Kabul, attracting musicians from north India. Their successors establish a new form of music based on the “ghazal”, an Afghan poetic genre about melancholy, love and longing. With the launch of Radio Kabul, the radio becomes the main center of musical patronage, as well as spreading Afghan folklore and the message of the Koran, and contributing to public education in Dari and Pashto. A new radio station is built on the outskirts of Kabul in 1960: Radio Afghanistan. The Ministry of Higher and Special Education establishes a music school for young people. Ferida Mahwash, Afghanistan’s best-known female singer, receives the title of Ustad (master musician) from the Afghan government. The censorship of music begins, following Nur Ahmad Taraki’s violent coup d’état; in 1979 Ahmad Zahir, “the king of Afghan music”, is murdered in Kabul. In 1996, the Taliban ban music because of its “corrupting influence”. Those found playing or selling it are imprisoned and tortured, and many musicians flee the country. During the 30-year civil war, cultural institutions are decimated. Music is nowhere to be heard. From exile in Australia, musicologist Ahmad Sarmast negotiates the rebuilding of music education with the Afghan government. Returning to Kabul, he inaugurates the Afghanistan National Institute of Music (ANIM) in 2010 under the patronage of the Ministry of Education. The following year, ANIM unveils its Afghan Youth Orchestra, made of boys and girls. 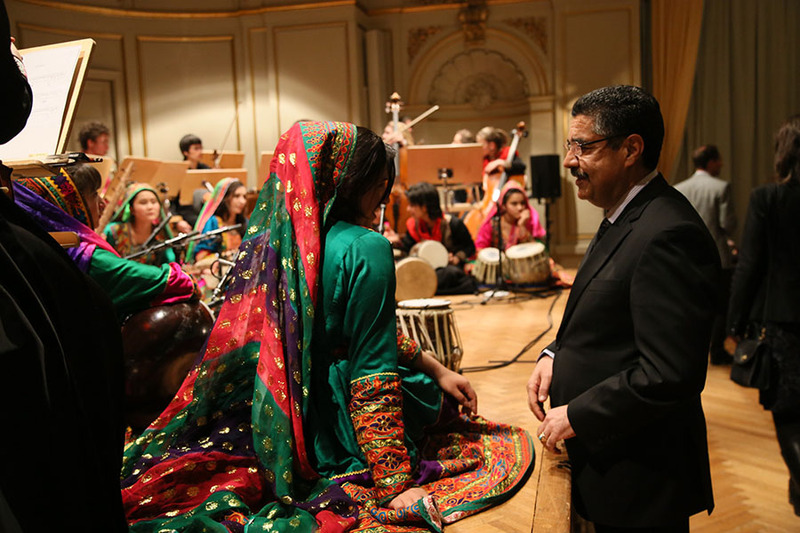 In 2015, the Afghan Women’s Orchestra, Zohra, is launched. In 2017, Zohra brings Afghanistan’s new-found music to the rest of the world. Zohra’s musicians are the first women in their families, communities and country to study music in over 30 years. They come from provinces all across Afghanistan to live in Kabul and study at the Afghanistan National Institute of Music, founded by Dr. Ahmad Sarmast. 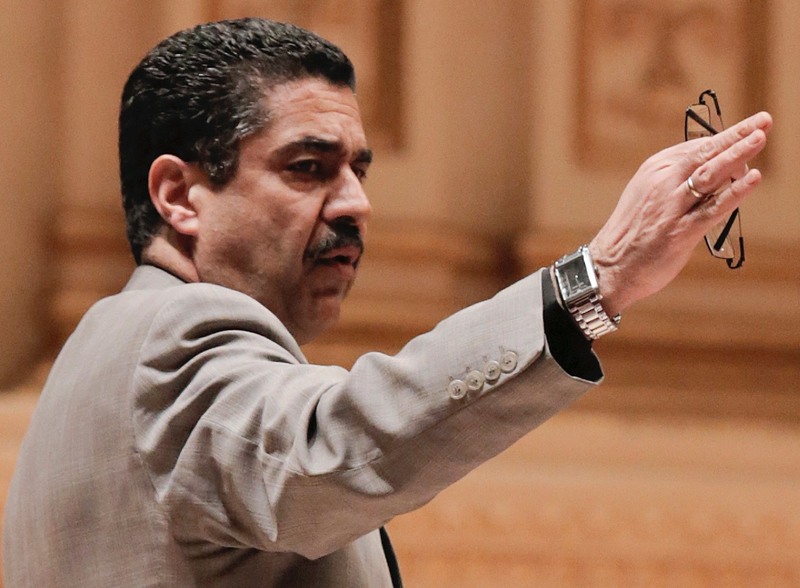 Among Zohra’s ranks are the country’s first female conductors, Negin Khpalwak and Zarifa Adiba. Orchestra members Sunbul, Shugufa, Anita, Taranum, Wajia Kabuli, Sahar, Zarifa Adiba, Ahmad Sarmast, Samia Ahmadi, Swinj, Wajiya, Nazira Wali, Gul-mina, Marjan Feeda-e, Gulalay Nooristani, Lauren Brithwaite, Negin Khpolwak, Madina, Shaperay, Maram Atahi, Marzia, Aziza Safi, Kreshma, Shukria, Mozhgan, Rabia Ahmadi and Mina. Deeply inspired by Zohra’s story, the World Economic Forum offered to be a platform for the ensemble to write the next chapter in its incredible story, and so it invited Zohra to perform at the Annual Meeting in Davos. In early 2016, the Forum’s team rapidly began mobilizing resources for Zohra’s visit. The Italian bank Intesa Sanpaolo sponsored the project, which secured core funding for production and flights from Kabul. The Forum then reached out to other partners in Europe to organise Zohra’s inaugural international tour; the ensemble would embark on a 20-day journey with 11 concerts in five cities. In Switzerland and Germany, they would share the stage with local youth orchestras in the spirit of intercultural dialogue. In Kabul, ANIM painstakingly secured permission slips for travel from each parent, and special government passports for each student and their chaperones. The visa application process was complex: Europe was tightening its rules during the throes of the refugee crisis, and getting visas for Afghans was difficult. Officials feared Afghan nationals would seek asylum once abroad. The World Economic Forum provided guarantees and submitted the paperwork. In the nick of time, one month before the tour, the German embassy in Kabul granted all applicants visas. Relief was as palpable in Kabul as at the World Economic Forum’s HQ in Geneva. With the theme of this Annual Meeting being ‘Responsible and Responsive Leadership’, what better-fitting a closing concert than an exchange with these extraordinarily courageous musicians. Partners in Europe readied themselves to receive the girls. In Geneva, members of the Orchestre du College de Genève, a youth orchestra, rehearsed the Zohra’s music as the holiday season approached. They would tour across Switzerland with them in the spirit of intercultural exchange. The stage in Davos would also be theirs. In Weimar, Germany, students of the Belvedere School of Music readied themselves too, learning about Afghanistan as well as its music and preparing to receive the Zohra for the concerts in Weimar and Berlin. On 13 January 2017, Zohra and their chaperones boarded their Emirates flight from Kabul to Dubai. They had a middle-of-the-night, six-hour layover. No matter, they were excited; their next flight would take them to Europe. Zohra were tireless in the run-up to their trip. They rehearsed for months: in addition to the Afghan pieces chosen for the concert, they also learned Western music and prepared an arrangement of Beethoven’s 9th Symphony. But how would Europeans react to these classical-music outsiders? Would they be able to communicate with their fellow musicians from Switzerland and Germany, and with audiences? Many knew English, but no German. They squeezed German classes into their tight rehearsal schedules. The chaperones bought warm clothing, translated tour schedules and prepared to provide artistic guidance and emotional support for what would be the first trip abroad for most of the girls. In Weimar, Zohra were greeted by the musicians of the Belvedere School of Music. They acclimatized and rehearsed with their new colleagues ahead of the German portion of the tour. They taught their European counterparts rhythms specific to Afghan music, such as the 7/8 time signature. Kabul can get cold, but it’s a far cry from the freezing temperatures of the Swiss Alps in winter. 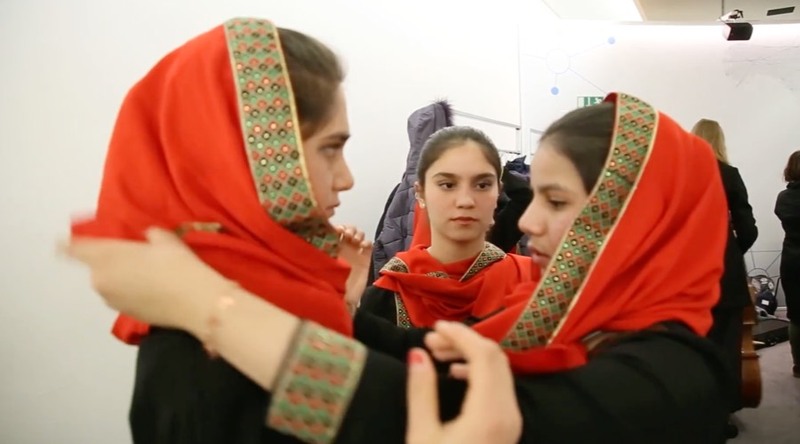 Dressed in matching winter coats, the 30 young women of the Zohra ensemble arrived in Davos at night. They shared their first dinner with the musicians from Geneva’s Orchestre du Collège, with whom they would perform across Switzerland. If it was not love at first sight, it was close. Something special had already begun. The excited murmur in Davos intensified with news of the orchestra’s arrival. Reuters got in touch. CNBC wanted a short performance. Where could the BBC meet the group? Swiss radio and television followed the group around. German media, ahead of the concert in Berlin, came in force. Back home in Kabul, national TV channel TOLOnews covered the story. Jet-lagged, dehydrated from Davos’ high altitude and under the global spotlight, Negin, Zarifa and Ahmad kept their composure as media outlet after outlet demanded answers to the same pressing questions. Who were these women? How did they find the courage to do what they were doing? Weren’t they scared of a backlash? A media frenzy developed as the story filtered all across the world. On closing night, as Zohra began to play, many people outside the Congress Hall, were glued to smartphones and tablets, watching the inauguration of Donald Trump unfold at the same time. Those inside received a musical offering of true beauty and dedication. The girls performed with all their being. They were playing for their lives. After an extraordinary closing performance in Davos to launch the tour, Zohra traveled the next morning to Zurich. Exhilarated and exhausted in equal measure, they performed that evening to a full house at the Zurich Tonhalle. Geneva was the coldest it had been in four years when the group arrived in the “City of Peace”. On the tramway from their hotel to the International School of Geneva, where they would rehearse and perform six concerts, they cheered every time they saw their faces on digital advertising boards. They grew more confident with each concert, performing for more than 1,000 children and two general sold-out shows. Marjan, first violinist, received the prestigious 2017 Freemuse Award for freedom of expression on behalf of Zohra. 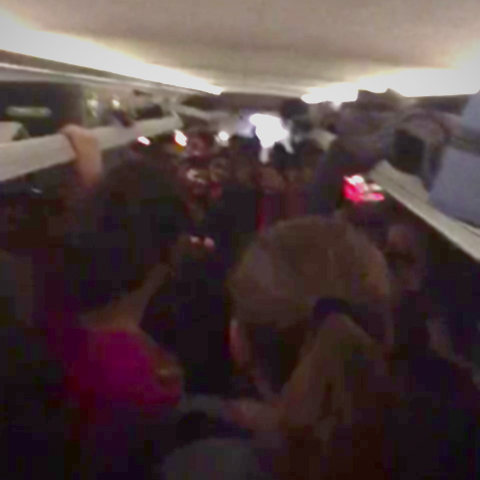 The journey with the members of the Orchestre du Collège was coming to an end. Lifelong bonds of friendship had been struck. Only a month had passed since the terrorist attack at the Christmas market in Berlin when Zohra arrived on a grey afternoon after a 16-hour bus ride. The orchestra would perform at the historic Kaiser Wilhelm Memorial Church, steps from where 12 people had been murdered and 56 injured. The girls each lit a candle at the pop-up memorial before the concert. Their performance was dedicated to the victims. The church had a capacity of 700, and the concert was free. The organizers had not been able to keep up with requests for tickets in the days leading up to the event. Chaperones walked the emergency exits during rehearsals, playing different scenarios in their minds. Might the girls be a target? All over Berlin and Germany, Zohra had been headline news. As the concert was about to begin, there was a delay. People were still streaming in despite the church being full; security officers were no longer able to perform checks. Outside, an impatient crowd of 2,000 gathered, unable to enter. The concert eventually began, music filled the space, the audience transfixed; when the ensemble performed the “Ode to Joy,” Europe’s anthem, lines between ‘us’ and ‘them’ were blurred. The standing ovation lasted for what felt like an eternity. The next morning, the girls visited Berlin zoo. Most of them had never been to a zoo before. They took selfies in front of penguins, mimicked the movement of baboons, sat in awe in front of elephants. When they chanced upon a playground inside the zoo, they rushed to the slides and the swings, and played with abandon. They were loud and reckless, filled with joy. On the last leg of the tour, Zohra returned to Weimar, where they had begun their adventure, to perform one final concert. The journey was ending, the return home nearing. It was a beautiful day at Hamid Karzai International Airport when the group reached Kabul. Hundreds of women and men, including family members, intellectuals, academics, artists, actors, poets and musicians were there to welcome Zohra back. They received dozens of bouquets of flowers. On national TV channel TOLOnews, reporting live from the airport, the girls spoke about presenting a different image of Afghanistan to the world. The girls who lived at the Afghan Child Education and Care Organization (AFCECO) orphanage now returned, others went back home to their families; some were already back at the school, now under increased security, rehearsing for their Winter Academy gala concert. The group was invited to celebratory receptions from the ministries of education and of women’s affairs, Tolo/Moby Media Group and more. 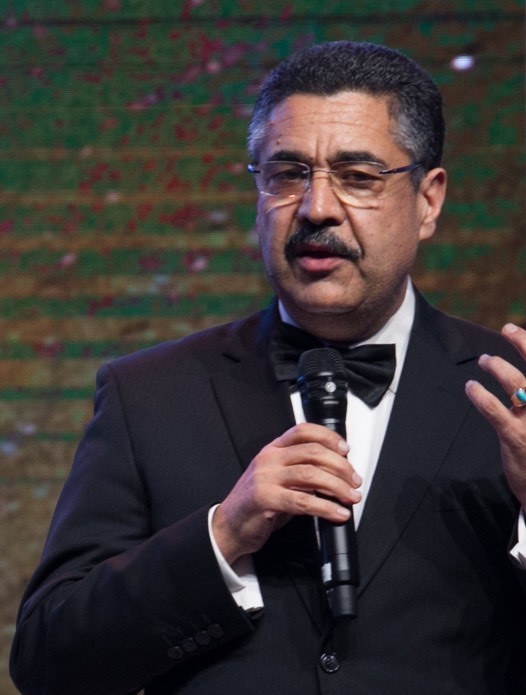 Every night that week, Ahmad spoke on local television and radio stations. News of the tour had now reopened an Afghanistan-wide conversation on the role of women in society, and that of music. The group received more than 20 new invitations to tour internationally. Zarifa’s mother and stepfather, the only members of her family to know of her involvement with Zohra, had tried to convince her brothers and uncles of the importance of music. Their opposition was so intense that she almost cancelled her trip to Davos, fearing what they would say. When she returned, her uncles were the first to congratulate her. Two of her brothers were still unhappy – but now she had the support of the rest of the family, she had more courage and believed her brothers would eventually come around. Aziza (left) and Sunbol (right), members of Zohra, at home. Many of the Zohra members live at the AFCECO together with other children including ANIM students. Here Zarifa, her mother and her little brother are preparing a meal at home without electricity. Sisters Sunbol (left) and Gulalai (right). The ANIM subsidized the living costs of its students at the AFCECO in the past and needs financial support to continue to do so in the future. Opened in 2003, the AFCECO is home to some of Afghanistan’s most vulnerable children. Here Zarifa’s grandmother and two aunts are visiting from Quetta, Pakistan, where they live as refugees. I changed my family. Now it is time for other girls to change their families because I am sure that slowly all Afghanistan will change. This is only the beginning of Zohra’s story. Support Zohra and become part of this extraordinary journey. Donations are received by “Friends of ANIM”, a 501(c)(3) non-profit organization registered in the United States. Your donation may be tax deductible depending on the laws of your country. Get in touch to book Zohra for an event or collaborate with Zohra on your next project. 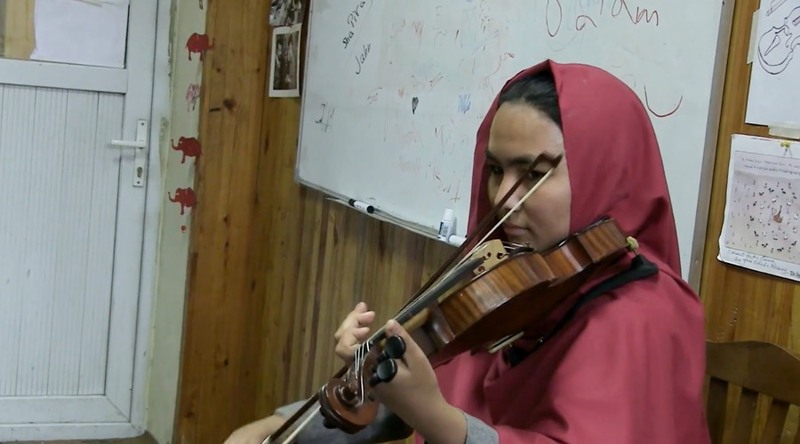 The first international tour of Zohra, the Afghan Women’s Orchestra, was conceived and produced by the World Economic Forum in collaboration with the Afghanistan National Institute of Music. Major partners included the Ministry of Education of the Islamic Republic of Afghanistan, Intesa Sanpaolo, the International School of Geneva, the Office Cantonal de la Culture et du Sport de Genève, the Orchestre du Collège de Genève, the Embassy of the Islamic Republic of Afghanistan in Geneva, 21C Media Group, Tonhalle-Gesellschaft Zürich, the University of Music Franz Liszt Weimar, the Belvedere School of Music Weimar, and Minz GmBH. Special thanks to Isabelle Muller, Philippe Genevay, Elyass Nory, Jessica Lustig, Mashal Arman, Mara Corleone, Arsène Liechti, Oliver Potratz, Suraya Dalil, Catherine Borer, Sarah Willis, Sadie Harrison, the Orchestre de la Suisse Romande, and the Berlin Philharmonic. This website is produced by the World Economic Forum in collaboration with the Afghanistan National Institute of Music. Design by Elkanodata. Special thanks to Sahra Mosawi, Sarah Elyounsi, Rachel Corner, Freemuse, John Baily and Deutsche Welle for the use of their materials. Ahmad Sarmast comes from a prestigious musical family. His father was the first Afghan to conduct a symphony orchestra. After studying for his bachelor’s and master’s in music in Russia, he wanted to return to Afghanistan in 1993. But the country was engulfed in war, and it was particularly dangerous for musicians. No longer able to stay in Russia, he was granted asylum in Australia where he earned his PhD in music – the first Afghan to do so – and established a career as an ethnomusicologist. After the fall of the Taliban, Ahmad returned to Afghanistan, intending to revive its musical heritage. 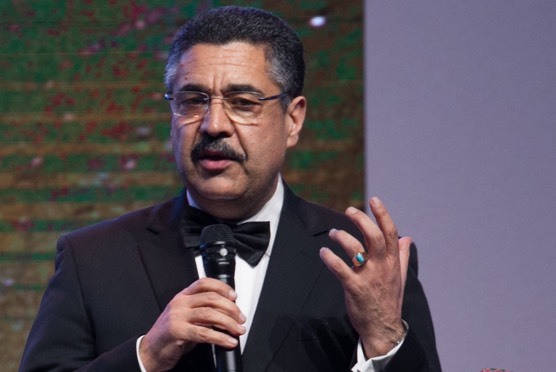 Despite the enormous cultural, economic and bureaucratic hurdles, in 2010 he managed to establish the Afghanistan National Institute of Music (ANIM) with the support of the Ministry of Education. At ANIM, boys and girls, regardless of ethnicity or socio-economic circumstances, can receive a general education while pursuing studies in traditional Afghan and Western classical music. A revolutionary concept that has brought much attention, positive and negative, to Ahmad and the school. One afternoon in December 2014, Ahmad was proudly enjoying a theatre performance by some of his students at a cultural center in Kabul. The play was about growth and rebirth after terrorism. When at one point the lights began to flicker, he reached for his phone. His driver, who also acted as his bodyguard, would send him messages if there were security alerts. Clumsily he dropped his phone to the ground. At the very moment that he bent down to fetch it, a teenager a few rows behind him detonated himself. Ahmad only survived because he had been crouched over during the blast. One person was killed, and many others injured. Ahmad lost hearing in one ear and needed several surgeries to remove nine pieces of shrapnel lodged in his head. The Taliban confirmed that Ahmad had been the target because of his promotion of music to children. He went to Australia to receive treatment. Undeterred, three months later, he returned. While the parents of all the ANIM students are supportive, they often face significant pressure from relatives and villagers as soon as they discover that their child – in particular girls – is studying in a co-education institution with a focus on music. Sometimes the girls leave without warning. Ahmad spends much of his time negotiating with families to keep their children in school. He has succeeded in bringing back many girls this way. Today, the school has 250 students, 75 of them female. Zarifa Adiba, one of Zohra’s conductors, dreamed as a teenage girl of becoming a pop star until she fell in love with classical music. Her minority Hazara family fled to Quetta, Pakistan as refugees when she was one; she later grew to love singing poems with her friends at school there. 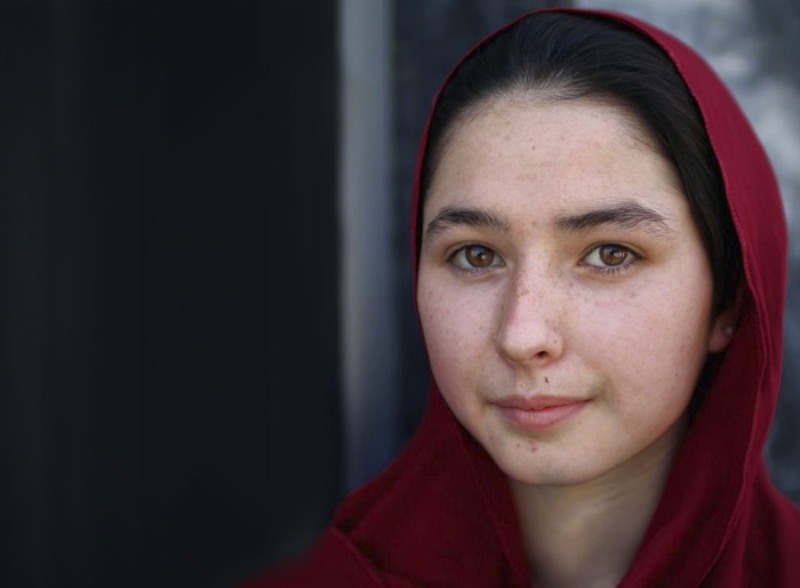 When she returned to Afghanistan aged 15 in 2014, she enrolled at ANIM. Like Negin, she only informed trusted relatives – her mother and stepfather – and faced hostility from other family members. She took up the violin and viola, instruments she plays in addition to her conducting duties. Zarifa has always displayed curiosity and a thirst for global affairs. She was Asia’s ambassador at youth political initiative Bridge the Divide in Australia where she participated in discussions and events with representatives of more than 25 countries. She participated in the Yale Young Global Scholars in 2016, as part of the International Affairs and Security program. She is an alumnus of the 2015 Youth Solidarity and English Language program in Turkey, where she was selected the best public speaker. She has contributed to literacy projects and participated widely as a speaker on women’s empowerment and youth diversity. Zarifa currently resides in Pakistan with her family. She is hoping to move to the West to train as a lawyer. 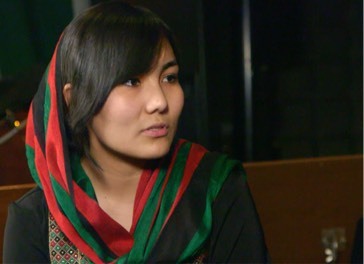 When she returned to Afghanistan aged 15 in 2014, she enrolled at ANIM. Like Negin, she only informed trusted relatives – her mother and stepfather – and faced hostility from other family members. 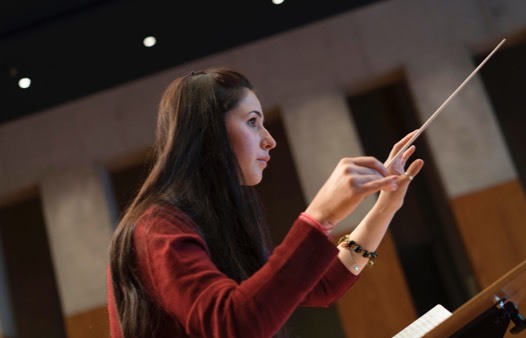 Born in 1997 in Kunar province, north-east Afghanistan, Negin Khpalwak has defied death threats from the Taliban and her own family to become the first female conductor in her country’s history. Negin showed a talent for music from a young age. As a girl in a traditional Pashtun community, she had to hide her passion, until one day she shared it with her father. When she revealed her ambitions to study music to other family members, her uncles threatened to kill her. They believed she would shame the family; they thought girls should not be allowed to attend school, let alone learn music. They also threatened her father, but he moved with Negin to Kabul so she could study at ANIM. The move led to them being disowned by the family. Negin is a talented student at ANIM. Lead conductor for Zohra, she studied the sarod for three years, plays the piano, actively participates as a percussionist with the women’s orchestra and also sings with ANIM’s choir, the Nahid Ensemble. 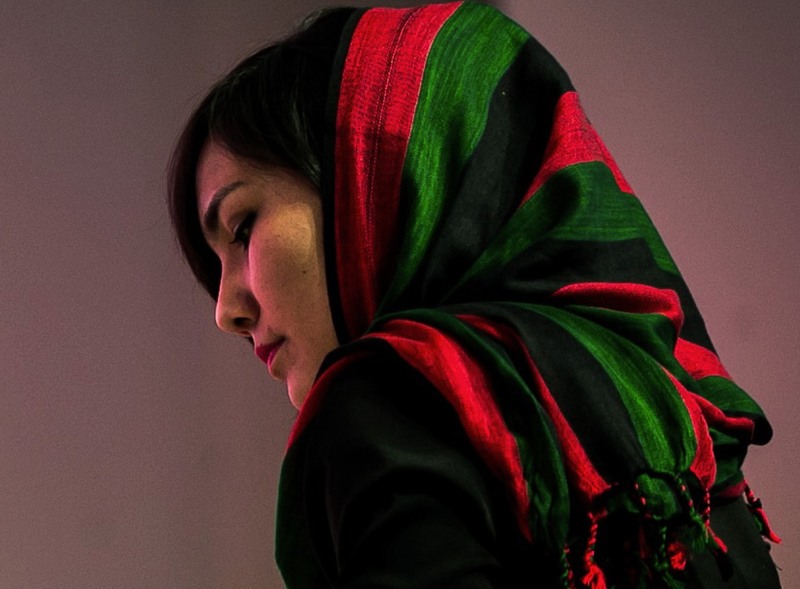 Prior to Zohra’s European tour, Negin has already traveled abroad to represent Afghan music. She went to Turkmenistan and the UAE with the Nahid Ensemble, and was a member of the Afghan Youth Orchestra that toured to the United States in 2013 where she became the first female Afghan sarod player to publicly perform. At the age of 20, Negin is a figurehead for young female leaders in Afghanistan and across the world. 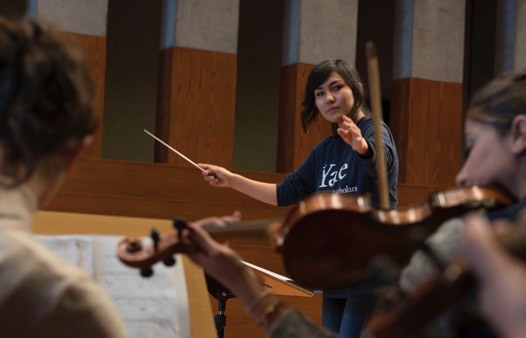 She wants to further her musical training in Europe or the United States, with a view to returning to her country to create and lead a future Afghan national symphonic orchestra. When she revealed her ambitions to study music to other family members, her uncles threatened to kill her. They believed she would shame the family; they thought girls should not be allowed to attend school, let alone learn music.